Everything’s bigger in Texas — and for filmmakers, that includes cash prizes. At the Dallas International Film Festival’s awards ceremony April 8, more than $100,000 in sponsors’ cash, goods and services (but mostly cash, and largely unrestricted) went to festival award winners. The top prize was the Target Filmmaker Award for best narrative and documentary, with each receiving a $25,000 unrestricted cash prize. These went to Clay Jeter’s “Jess + Moss” as best narrative feature and to Anne Buford’s “Elevate” as best documentary. 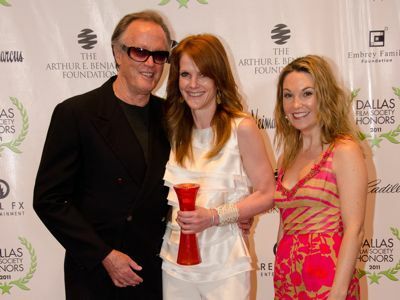 Peter Fonda presented the awards at a ceremony held at Dallas’ downtown Union Station. Receiving her award, Buford announced that she would donate the money to Seeds Academy, the Senegal boarding school for basketball players whom she profiled in her film. The DIFF launched in 2007 with a three-year trademark agreement from AFI. Their first solo year was 2010 and, thanks to sponsors like Target and Texas utility company TXU Energy, the money hasn’t stopped flowing. Previously announced Steuben Crystal DALLAS Star Awards were presented to director Steve James (“Hoop Dreams”), writer-producer Scott Z. Burns (“An Inconvenient Truth”) and posthumously to writer Horton Foote (“To Kill A Mockingbird”). The Texas Avery Animation Award went to Chris Sanders and Dean DeBlois (“How To Train Your Dragon,” “Lilo & Stitch”).